ICTBroadcast’s Inbound Campaign is a pioneering innovation in automated telemarketing. Inbound Campaign is one of best marketing practice because it brings genuine leads rather than reaching outbound to cold and questionable targets. Inbound campaign ensures high conversion levels at minimal cost, it does, however, take an ample commitment and patience to get you the desired results. Outbound campaign like Interactive / Press 1 Campaign largely focuses on outbound methods such as cold calls. The idea behind these techniques was to get in front of cold leads and warm them up to the point where they would try your product or service. Inbound Campaign empowers businesses that compete in tightly regulated markets to turn the system on its head. The company issues a DID contact number to its customers, inviting them to call it, and then channels incoming calls by keypad menu selections. A standard recorded or IVR message greets the customer, who is transferred to a specific live agent or to a team of agents. 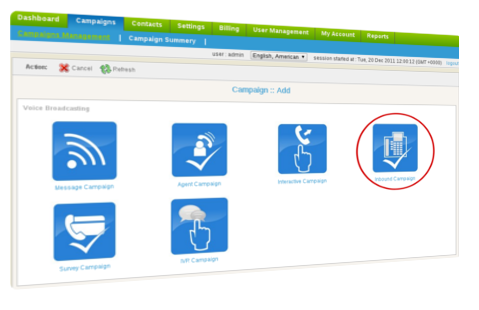 This is an ideal, simple-to-set-up, and simple-to-use system for handling many incoming customer queries. Inbound Campaign generates genuine leads, ensuring high conversion levels at minimal cost. ICTBroadcast Survey campaign is to make automatic survey/polls without human intervention. It dials number from contact list, on answer by the recipient, asks set of questions and records their responses from recipient and prepares complete both summary and detail report for further analysis.